We started with an order of guacamole and chips. The chips were thick and crispy. The guac had a little kick that helped balance the chill of the fresh avocados, cilantro, and tomatoes. 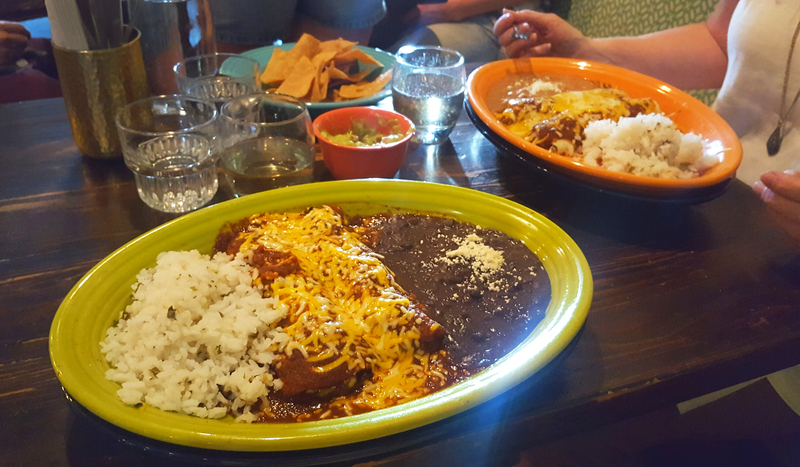 I ordered the chicken enchiladas with black beans and rice, and nearly chose the green enchilada sauce until my server cautioned me about its high octane fire. Good to know! The red sauce came with plenty of heat. I consumed way beyond my normal level of “full” because it was so tasty. I wish I had left some room for the fried ice cream or churros, which I heard is a house specialty. Their house Sauvignon Blanc was a refreshing accompaniment to the spicy meal. Appetizer, entrée, and 2 glasses of wine, all for under $30 per person!